1. Melt butter in a saucepan over medium heat. 2. 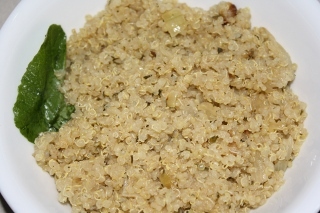 Add the quinoa, and toast, stirring occasionally, until lightly browned, about 5 minutes. 3. Stir in broth, and bring to a boil. 4. Reduce to a simmer, cover, and cook for 15 minutes, or until quinoa is tender. 5. Sauté the onion in butter or oil until caramelized. 6. Add the garlic and cook for 30 seconds. 7. Combine the rest of the ingredients in a bowl, add the quinoa and onions and enjoy!